Much has been made of the sixtieth anniversary of J D Salinger’s The Catcher in the Rye, one of the most popular novels ever written in the voice of an angst-ridden protagonist (the adolescent Holden Caulfield). 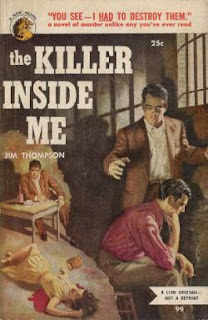 But there’s another subversive American novel with an even more disturbed narrator, which was published around the same time: Jim Thompson’s The Killer Inside Me. Though acknowledged as a classic of crime fiction – and venerated by many of us who love the genre – Thompson’s novel isn’t as well-known in the wider literary universe as The Catcher in the Rye is. (Salinger’s book, once the subject of controversies and banned in many schools and colleges, today occupies a firm position in the literary mainstream. Oh yes, it does. Don’t pout so, you disaffected little adolescent – it’s no longer glamorous or radical to identify with Holden, it’s a cliché.) I’m not saying Killer is as good as Catcher, though the two works are sufficiently different for comparisons to be avoidable. What it is, though, is a very unnerving fictional self-portrait. The voice is that of Lou Ford, the deputy sheriff of a Texas town ambitiously named Central City. He appears to be nothing more than a kindly law-enforcement officer – with an annoying habit of tossing off platitudes like "if we didn’t have the rain we wouldn’t have the rainbows" - but soon we discover a not so pleasant side to him. In the context of the literature and cinema of the time, Lou is closely related to such anti-heroes as Patricia Highsmith’s Tom Ripley and Bruno Anthony; perhaps even the likeable Norman Bates in Hitchcock’s Psycho. But I can’t stop thinking of him as a kindred spirit to Holden Caulfield – it’s one of those ideas that take root in your mind and refuse to leave. “I hadn’t had the sickness in almost 15 years,” Lou tells us early on, “Not since I was fourteen.” Reading this, and discovering the nature of his “sickness”, how it regains hold of his mind and what it leads him to do, I was reminded of the famous penultimate chapter of The Catcher in the Rye – Holden’s description of his own nervous breakdown as he watches his little sister riding a carousel in the rain. With a few minor changes in personal circumstances, it’s possible to speculate that Holden could grow up to become someone like Lou. For all the placidity, even languor of its narrative, The Killer Inside Me constantly plays on the reader's expectations of Lou's sickness exploding to the surface. And sure enough, it contains two passages of such ferocious violence – both aimed at women – that Michael Winterbottom’s recent movie version (made in a much more permissive time) was accused of being misogynistic, when it was merely being faithful to a book where the bad guy is a man. Thompson would go on to do more accomplished work (his Pop. 1280 can be seen as an expansion on the themes of The Killer Inside Me), but this creepy, insidious novel occupies its own special niche in crime writing. 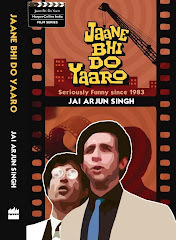 Had watched the movie sometime ago. Yes, you are right about not being provided with an insight into the development of the character's psyche. It's worse in the movie (we don't even see him reading psychiatry stuff as a child). Liked the movie though. Could it be intentional by the author? To let his character be and act in the present and refrain from explaining or attaching meaning to his behaviour? Perhaps a smart way of disguising one's laziness or a brilliant coverup for lack of a coherent flashback story. Indisch: there is a back-story for Lou in the book, but it isn't presented to us in the form of a full-fledged, prolonged flashback - instead, we get little glimpses of his troubled childhood and we are left to fill in some of the details ourselves. What I meant in my post is that Lou himself gives the impression of knowing how his "sickness" began, but by the end we realise that he has unfathomed depths, and that everything can't be conveniently "explained". In this sense, the book reminds me a bit of the ending of Hitchcock's Psycho, where a smug psychiatrist explains Norman Bates to us, but then the final scene brings us face to face with a mental condition that no one can fully unravel. I'm currently reading Sebastian Faulk's Engleby, which is also a fictional self-portrait of a person who seems normal, though socially awkward on the outside, but has a hidden side to him. I've liked it so far; and it's interesting to read this post about another such character. what is great about catcher in the rye for it to become a cult book? i saw nothing great in it. it was rather boring. or are you supposed to say its a great book simply because everybody else says so? it did nothing for me. it was thoroughly insipid. "The Killer Inside Me" is a masterful example of how a talented author has it within his or her power to manipulate readers.